When we see a pile of old wood or a chippy paint door, our creative brains start racing! Our imaginations immediately travel down the “what can I do with this” track! We draw energy from our customers who are traveling down that same track… the ones who walk into our warehouses and immediately see potential. 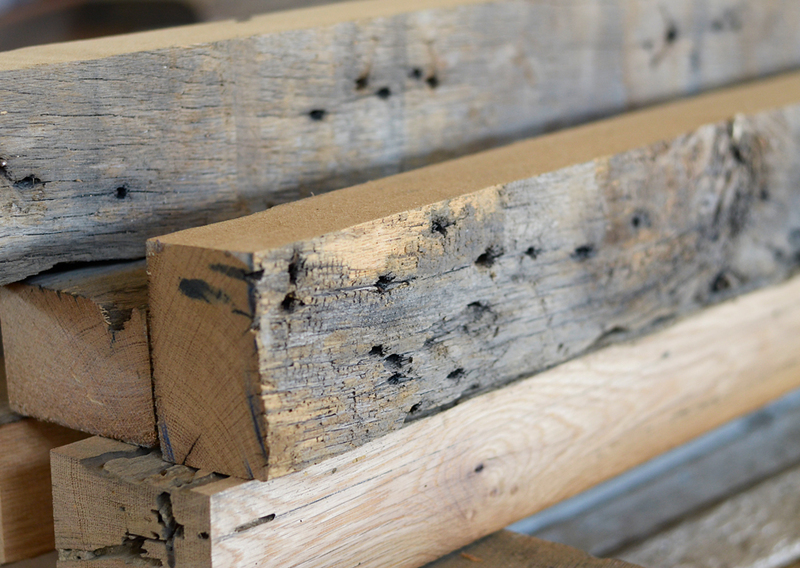 This imagination, coupled with a creative process is what turns a pile of vintage lumber into a beautiful treasure. Such is the case with this stunning coffee table. Team member, Tyler Dooley, recently built this beautiful piece of furniture for one of our customers. The table was constructed using a stack of salvaged, circular sawn oak beams. The 3″ x 5″ beams were ripped and lightly planed. Great effort was made to ensure that as much of the original patina as possible was preserved. 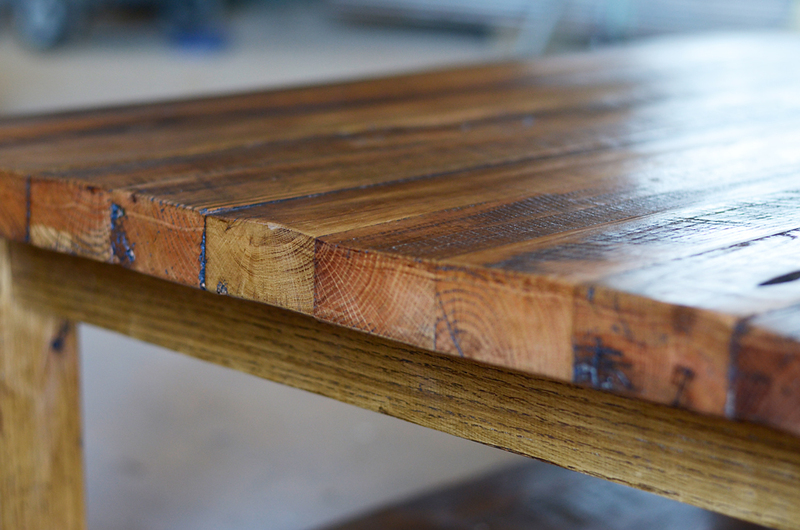 Once the table was constructed, Tyler applied Briwax in a rustic pine color to finish the table. The Briwax brought the wood to life and gave it that rich tone that shows off its character and natural patina. The pictures to below show the details of the finished wood table. Southern Accents has a talented team of artists and craftsmen available to help you plan your next project. Whether you are looking for a custom piece or just need help selecting the right materials for your next creation, we are here to help. We can be reached by phone during regular business hours Tuesday – Saturday or you can e-mail us 24/7! Better yet… stop by, take a look around, and share your creative projects and ideas with us! We are open Tues – Fri from 9am till 5pm, Sat from 10am till 4pm, and Mon by appointment only. 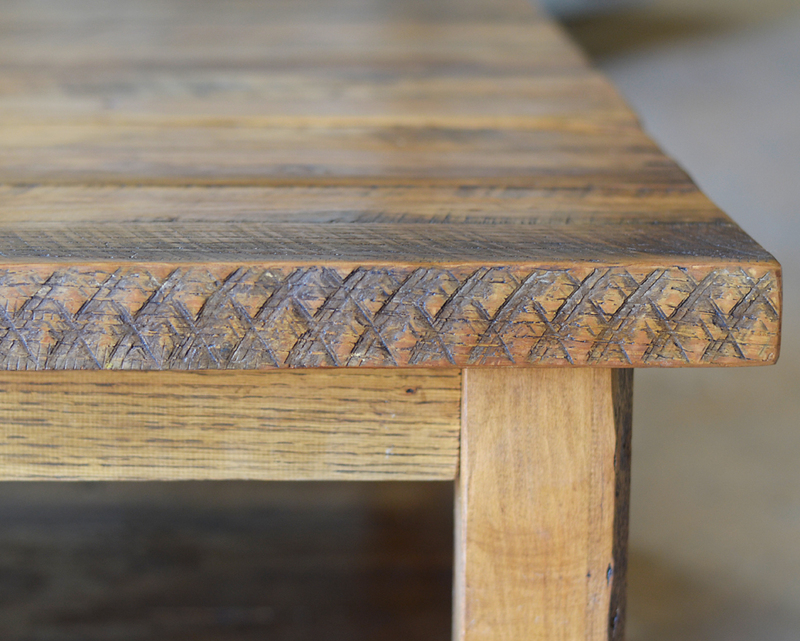 The circular sawn markings add character to the wood. 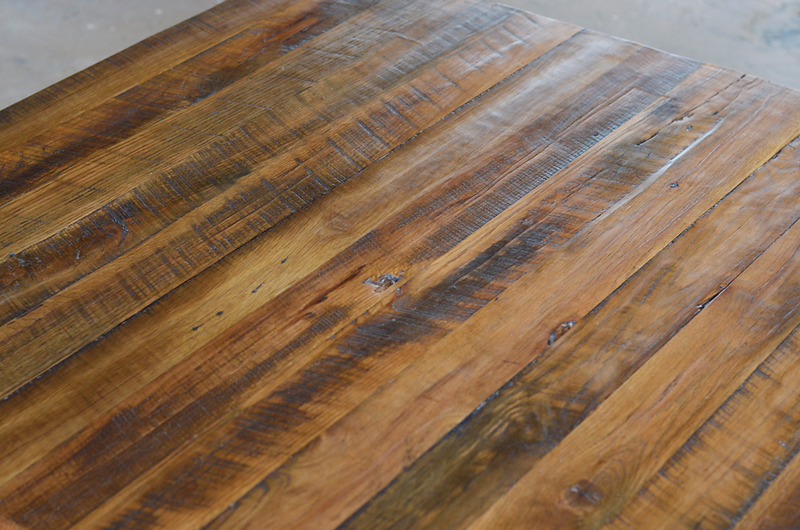 The table was finished with Briwax which helps to seal and protect the wood without covering up the natural patina. Every Tuesday morning at Southern Accents begins with a team meeting. This is actually the only time during the week that we are all in one place at the same time. 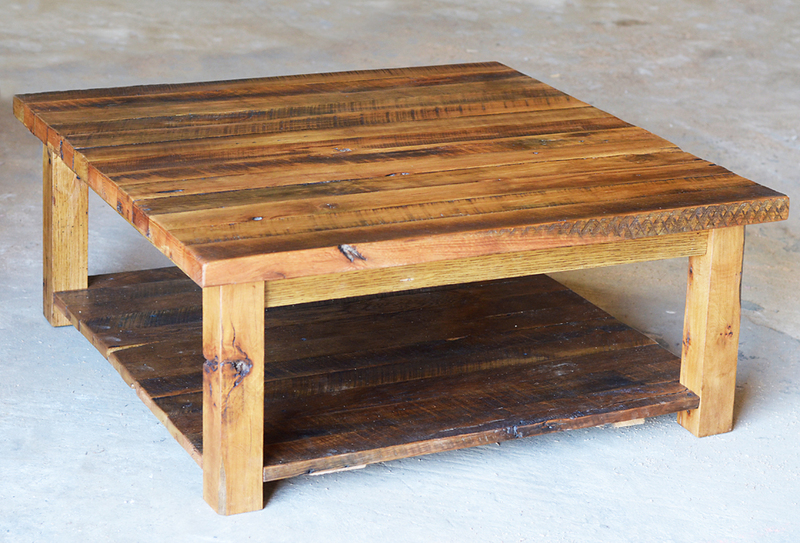 We gather upstairs and sit around our large, custom made salvaged wood table. Ben arrives with a bag of fresh, warm doughnuts from one of our local bakeries. Everyone grabs a cup of coffee or a bottled Coke from the cooler and we begin the meeting with prayer. The primary purpose for our weekly gathering is two fold: to encourage one another and to plan our schedule for the upcoming week. 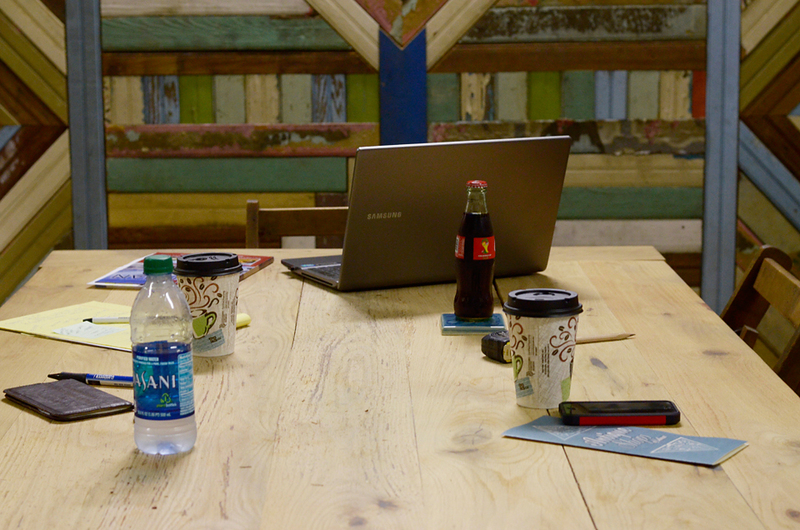 Our weekly meeting has become an integral part of our business. We always spend a few minutes discussing personal issues. We talk about our kids, our pets, our weekend ventures. We laugh a lot and at times have shed a few tears. This is our time to catch up with one another and make sure that we are all doing well. If there are needs or issues to be addressed, we do it here. The next order of business is business! We each have our “to do” list that we go over in detail. The goal is to make sure that we are all on the same page. We discuss custom orders, sales goals, deliveries, and upcoming projects. We talk about marketing and toss around ideas for newsletter topics. And we talk about wood… we talk a LOT about wood! The bulk of our business involves wood. Wood doors, wood mantels, wood columns, wood corbels and wood trim. We have an entire warehouse filled with nothing but salvaged wood. Everything from old barnwood to antique wood flooring. Wood that has been salvaged from the walls of historic houses and vintage beams from old log cabins and industrial mills. If you were a fly on the wall listening in on the conversations, there would be no doubt about the fact that we love what we do! We have a team of creative artists who get excited about an upcoming salvage mission. Skilled craftsmen and wood workers who gaze on a stack of salvaged wood the way a painter looks at a blank canvas. Ask our guys what they “do for fun” and they will be quick to tell you that they spend their free time building furniture or creating artistic pieces for no other reason than to feed their creative soul! Stop by our showroom or wood warehouse and talk to any of our team members! We love to hear about your creative ideas and to give input in the design process. Our knowledgeable team can help you pick out the perfect materials for your next project! Speak of artwork and the vision that pops into most people’s mind would be that of a framed canvas, hanging on a wall, showcasing a beautiful scene or portrait created by an artist via the use of brushes and paints. While a canvas may be the most recognized medium for artwork, art takes on many different forms and the canvas could be just about anything! Photographers, wood workers, sculptors, welders, musicians, chefs and other creatives are producing exquisite works of art from some of the most unlikely mediums. If you are a regular reader of our weekly newsletter or have visited our showroom in the past few months, you’ve surely already seen our salvaged wood wall. 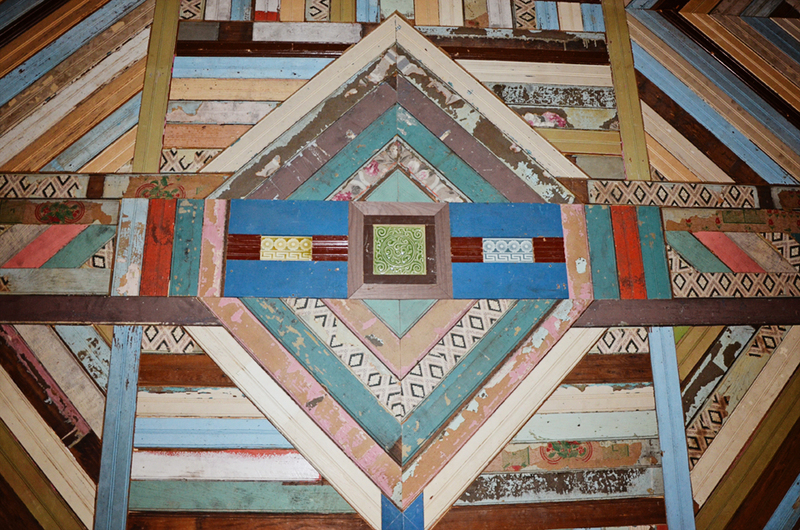 This work of art was created from a pile of discarded wood sitting at our wood warehouse. Artists and creatives visit our showroom weekly seeking old tin ceiling tiles, salvaged wood, old doors, glass paned windows, and salvaged hardware, to be used as a canvas for their unique works of art. We have THE most creative customers! We are always humbled by your passion and intrigued with your many unique ideas. What’s your canvas? Summer is a great time to allow your creative juices to run rampant! We have a warehouse full of salvaged items waiting to be turned in to beautiful works of art. If you need a little inspiration, check out our Pinterest boards. We’ve pinned a lot of ideas to get you started. Stop by our showroom and talk with us about your next project. We also LOVE to receive pictures of your finished works. If you have a picture to share, please send it to info@sa1969.com or feel free to post pictures to our Facebook page. Southern Accents is a 45 year old family owned and operated business that resides in the heart of historical downtown Cullman, Alabama. We love our community and the small town values of the people we are surrounded by. While the internet has allowed us the opportunity to reach customers worldwide, having a physical presence in a second location has been an idea that, in recent years, we have considered. We’ve always believed that for this idea to become reality, the right opportunity would present itself and that when it did, we would know it. That right opportunity was recently presented to us! We now have a presence at The Tanner House in Nolensville, Tennessee and we are beyond thrilled! Nolensville is a small, thriving town in East Tennessee. The area very much reminds us of downtown Cullman. When our good friend Mike Minard approached us with an idea that would allow us to showcase some of our architectural finds there, it just felt right. This past April, Mike and his wife Gretchen opened for business. The Tanner House is a vintage market located in an early 1900’s house that sits on the strip in Nolensville’s historical downtown shopping distract. Visit The Tanner House and you will find a unique collection of antiques, vintage goods, gift items and architectural finds. Southern Accents has placed a unique collection of architectural antiques, including antique doors, mantels, bath fixtures, lighting, windows and more, at The Tanner House. Our hope is that expanding our physical presence will allow more people the opportunity to see the quality and beauty of the architectural pieces that we are salvaging. Pictures are great and words can be very descriptive, but there is no replacement for being able to physically see the grain and patina of aged wood or run your hand over the lines and curves of a piece of antique wrought iron. While this is a new venture for us… it is one that we hope will grow and expand over time. We invite you to stop by The Tanner House and shop all of their beautiful inventory of antique and vintage goods, including architectural pieces from Southern Accents! Located about 15 minutes outside of Franklin, Tennessee, you can find them at 7307 Nolensville Road. They are open Monday through Saturday from 10 am till 6 pm. You can reach them by phone at 615-776-7307. When you stop by, don’t forget to tell them that Southern Accents sent you their way!